Your smile is part of your appearance, and you should feel confident with the way it looks. If your confidence is suffering because your smile is not as bright as it should be, cosmetic dentistry from Carnazza Dental Medicine can help. You may not even recognize the full potential of your smile, but our cosmetic services can strip away years of dulling, damaging effects on your teeth, and reveal a whole new level of happiness. Cosmetic dentistry isn’t just for the aesthetically conscious person, either. Every cosmetic service we offer promotes oral health along with beautifying your smile. When your smile is healthy, it radiates naturally. That’s why we take care to ensure every treatment advances your oral health and delivers a smile that’s even, bright and free from imperfections that can affect your confidence. No matter what you need to get the smile of your dreams, we’ll tailor our services to provide just what you require. No two smiles are the same, which means there’s no specific cosmetic treatment for every smile. The desired result may be similar, but the process is unique to everyone. We’re prepared to deliver individualized treatment to help you achieve optimal results and get the smile that looks its best. Dr. 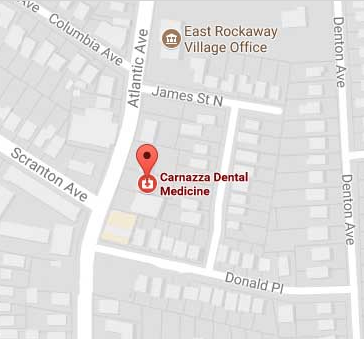 Guy Carnazza and his team are happy to help you transform your smile. Don’t wait to restore your confidence and enhance your smile’s appearance. Call us today to discuss the cosmetic dental services that are right for you. Be confident in your smile. Ask us about Cosmetic Dentistry. Maybe your smile is uneven, or maybe you need a restoration but you lack the healthy enamel necessary to support it. In these cases, Dr. Carnazza can perform a crown lengthening treatment, reshaping the tissue around the bone. This process extends the height of your enamel above the gum line and creates a stable base for a restoration. What’s the first thing you notice when you look at your smile? If your gums seem too dominant, you can create a more even smile and balance the ratio of gum tissue to enamel with a recontouring procedure. Just a little is all you need, as this process involves reshaping the tissue around the gum to expose more of the tooth’s enamel. Gum recontouring can also be an important part of a periodontal treatment plan so patients suffering from gum disease, as it shrinks the gum pockets and makes them easier to clean. Those little imperfections in your teeth – the ones that always seem to announce their presence whenever you smile, can easily be fixed with composite bonding. Dr. Carnazza uses dental artistry to sculpt tooth-colored composite material onto the enamel surface, creating a smooth, even look. Composite bonding can correct cracks, chips, discolorations, small gaps and grooves, and is an alternative to porcelain veneers. Tooth recontouring is performed to create an even appearance of your teeth. Dr. Carnazza will remove small amounts of your tooth enamel to change the shape, size, and length of your teeth, balancing your smile and correcting teeth that are too long or overlap. Generally, patients use this procedure to change the length of the canine teeth, and improve the look of their total smile. How bright is your smile? Is it as white as you’d like it to be? If not, our smile whitening treatments are the solution. Better than the over-the-counter treatments you buy at a drugstore, our professional whitening treatments offer effective stain removal and enamel brightening. Whether the discoloration is caused by nutrition, genetics, lifestyle, or medication, we’re prepared to help. We offer Opalescence Boost gel treatments in our office, bringing about whiter teeth in less than one hour. Get the most brilliant, radiant smile possible! Imagine your perfect dream smile. Now, achieve it with porcelain veneers. The process requires some preparation of your tooth enamel, followed by the bonding of a very thin piece of porcelain. Veneers are custom-created to match your natural teeth in both shape and color, and look completely natural. They are often used to fix gaps, chips, and cracks, and provide an instant smile transformation. With proper care, dental veneers can last more than ten years, so you’ll be investing in a beautiful smile for years to come. I highly recommend Dr. Carnazza and his staff. He provides a wonderful friendly service all around. He is very informing, calm, and thorough. He explains things to me in a way I understand and makes me comfortable and motivated to take care of my teeth. His office is also kid friendly. I take my kids to see him, and they are not afraid to go (as you know most kids fear the dentist). He is very patient and caring with my children. My whole family is very comfortable going to his office, and we always recommend him to all of our families and friends.